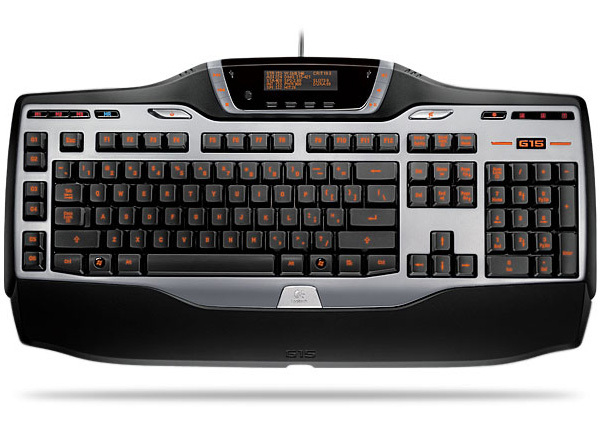 If you call yourself a serious gamer yet do not own the Logitech G15 Gaming Keyboard, you are hardly a gamer at all! The G15 from Logitech is the most advanced gaming keyboard on the planet. What makes it soooo great you might ask? Well for starters it is the one and only gaming keyboard to feature a secondary LCD display! This integrated screen can display vital information about your game, in game communications with teammates, timers, game events, and macro settings. Find out what server your friends are using to play Battlefield 2142, receive notification when your World of Warcraft battleground becomes available, you can even identify who's speaking in Ventrilo! While one of the coolest features of the G15, this is not its only accolade. The left side of the keyboard features 6 "G" keys that are fully programmable to perform in game functions and complex macro key stroke combinations at the touch of a single button. An in game macro record key even lets you record macros on the fly! Night gamers will enjoy full orange LED backlighting on every key reverse glow style orange backlighting on the LCD display itself. The back lighting can be cycled through three modes, hi, low, depending on personal preference. A removable wrist rest and two USB connectors further add to the convenience of the G15. Windows key related deaths got you down? The G15 Gaming Lockout Switch disables any dangerous keys that could result in gaming travesties. So if you think for a minute that you can dare to call yourself 1337, yet are still using a standard keyboard, you better get yourself a G15 Gaming Keyboard from Logitech pronto!